Luddites were 19th-century English textile workers (or self-employed weavers who feared the end of their trade) who protested against newly developed labor economizing technologies, primarily between 1811 and 1816. The stocking frames, spinning frames and power looms introduced during the Industrial Revolution threatened to replace them with less-skilled, low-wage laborers, leaving them without work. 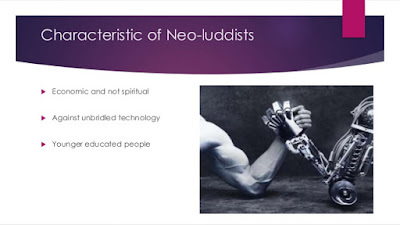 The Luddite movement, under the leadership of General Ned Ludd, culminated in a region-wide rebellion in Northwestern England that required a massive deployment of military force to suppress. 2) Industrial Revolution was based on the principle of enhancing productivity and the era led to invention of several machines such as introduction of machines in the cotton industry etc which threw several workers out of work. 3) These workers also did not enjoy basic rights such as right to vote, minimum wage, good working condition, safety at workplace which enhanced dissatisfaction amongst them. When they went to strike, force was used against them. This led to feelings of desperation amongst the workers and they started destroying power looms in Lancashire which they believed had affected their livelihood. There was also resistance to the introduction of machines in the woolen knitting industry, destruction of shearing frames by croppers etc. Luddism thus came into being. Luddism was not just a backward looking assault on machines. Its participants demanded a minimum wage, control over labour of women and children, work for those who had lost their jobs because of machines, right to form trade union so that they could legally present their demands. 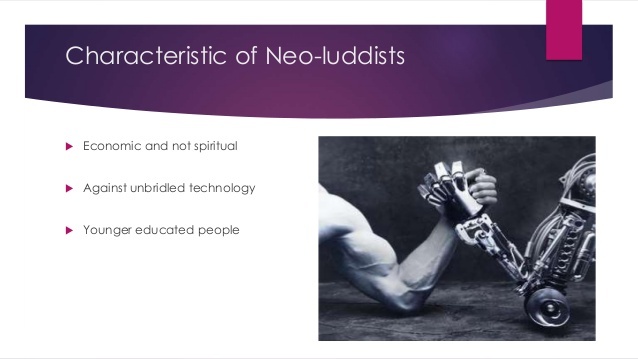 Historians today agree that Luddism was not just a movement against machines but was married to the larger goal of improvement in the lives of workers. 1) Technology today has become indispensable to our way of life. The kind of problems we face require technological innovation. For instance, calling for an anti Internet movement is going to be detrimental to human progress as internet today has become a way of life and is responsible for eliminating much information asymmetry. 2) Role of satellites in enhancing food production, dealing with droughts, forecasting disasters is huge. This role can not be performed by humans as such. While the role of technology is immense in current day and age, it makes sense to slow down, evaluate what we have achieved, ask ourselves in practical terms what we have gotten for our money, asks us what environment our children are growing up in. The debate holds relevance in current times.